Part I - Determine which people are using credit. Part II - Using a chart, determine which bank would be best for each person. 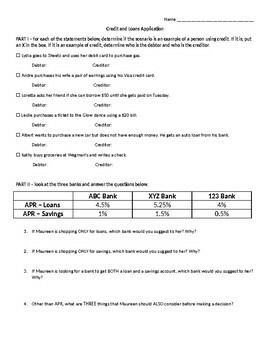 Part III - Students are given the monthly percentage rate and must calculate what the APR is. Then, they must determine which bank would be the best to get a loan. 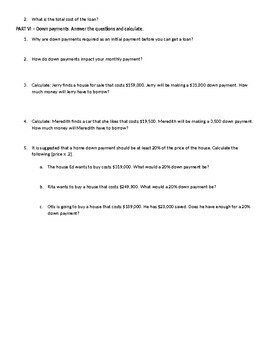 Part IV - Read a scenario of someone with a loan and answer questions. 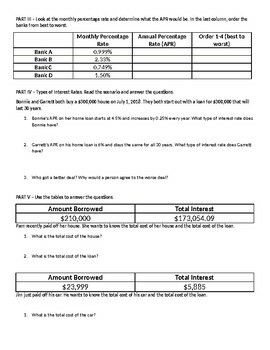 Part V - Use tables to determine the total cost of the loan and the total cost of the purchase.